The Duchess of Cambridge left the world in awe on Monday when she posed for pictures with her newborn baby just seven hours after giving birth. 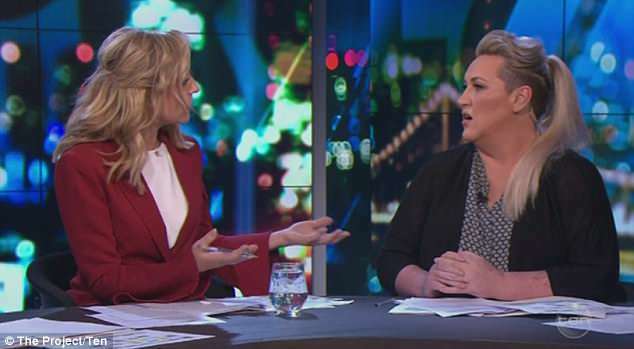 But on Tuesday night’s edition of The Project, panelist Meshel Laurie claimed it was ‘troubling’ that people were praising the new mum for being back on her feet so quickly. ‘You know what I find troubling is all those young women saying, ‘Oh, it’s inspiring’. That’s not inspiring!’ she slammed in a segment about the royal birth. ‘She DOES have that option! Mate, what are they going to say?’ Meshel retorted. ‘She needs to hold on to the sides of the bed and say ‘GET OUT!” the comedienne continued. Earlier in the segment, during a live cross to London, UK correspondent Lucy McDonald claimed England had been left ‘in awe’ of Kate and her seven hour turnaround. After giving birth to her third child at St Mary’s Hospital in London on Monday, Kate stunned in a red knee-length shift dress with a pretty white lace collar. The frock was by one of the Duchess’s favourite designers, Jenny Packham.